I cannot believe that I am actually posting this story. Caveat: If you secretly yearn for the zesty lemon fragrance of freshly Fabulon-ed sheets and towels, please do not read any further. However, if you have ever camped for a week in a desolate location without proper showering facilities, then continue with caution, but please accept my apology in advance for what is to come. I was Backpacking around Europe at the age of 20 in 1983, and a friend in Germany kindly offered me the use of his vacant apartment in Paris for a week during the French tennis open. I took him up on his gesture, and life in the Parisian sunshine, for the first 4 days, was like something lifted directly out of a travel brochure. My luck ran out very early on the 5th day when some guy and his wife burst into the apartment, full of attitude and aggression, claiming to have made previous arrangements to stay in the same apartment for the next 7 days. There were a lot of rapid hand gestures, French exclamations through clenched teeth, personal space invasion, and severe doubt cast over my birth status, sexual preferences, and ancestral lineage; before I was suddenly cast out onto the street, reasonably insulted, with the mercury rising, and without the benefit of a shower. There may have even been a final shrill (but then muffled) insult directed at me as the door slammed shut. Oddly enough, hotels aren’t exactly chasing you for business when the French Open is on. After many hours of lobby shopping, the only place in Paris that would have me for the next two nights was a shabby little back street establishment that had been built before they discovered water. Seriously, my room was like a broom closet. In short, I went without a proper shower for three long hot summer sightseeing days. I tried sneaking into other hotels that had running water but they saw me a mile off; I was that unwashed guy that they are highly trained to look out for. I had to settle for limited splash washing in cafe powder-rooms, but of course you never get the same coverage. It was a record-breaking heat wave; I was chalking up the kilometers, and I was hygienically unhappy. Stray animals began following, at a safe distance, behind me. Large birds gathered, with an air of expectancy, in nearby trees. A Renault mowing down a nearby fire hydrant would have truly been a godsend. I’m still learning to deal with the shame. At the end of the week, I returned to the place where I was staying in Germany a little heavier. I walked differently; a bit like John Wayne after riding a horse for a month. My hair was oily and plastered to my skull, and my body odor had a pulse of its own. When I walked in the door, no-one seemed very interested in talking to me, so I headed straight for what was possibly the best, hottest, and longest shower I have ever had. I let the water cleanse away the indignity of the previous days, but I noticed when toweling off that some unwanted sweat rashes remained. My hosts had left an elaborate array of deodorants and body talc’s on the ledge above the wash basin, and a frenzy followed. I covered my body in talcum powder. I smelt great, looked clean, but still walked funny. The only option available to me now was to slide off to bed and pretend that the previous three days hadn’t happened. Something woke me up in the middle of the night. I felt rigid, like I’d been immersed in a mud bath and had been laid out to dry. Mind racing, I “zomby walked” into the bathroom to take stock of the situation, and then hurriedly hunted down the bottle of talcum powder that stood, now mocking me, on the shelf above the basin. I don’t know what they call it in Germany, but here we call it “Ajax”. I looked in the mirror, and my jaw had dropped so much I could see where my tonsils had been removed when I was six. I immediately swung into damage control, and moved to wash off the household cleaning agent. It wasn’t until I had the water running that I remembered the ad with “No Mess” Charlie; that jolly, oval-faced plumber that cleaned up his mess in a jiffy with the wonderful new formula Ajax. You may remember how the “Deep Action Cleanser” really worked hard (like Charlie) to get in and get the job done. If water had met powder that night, my fathering future would have been napalmed before my eyes. Nevertheless, I had to act quickly, because I noticed that the sweaty areas had started turning blue. Again, I had memories of Charlie swishing out the vanity grime with Ajax’s magical blue rinse. I don’t know how long it took me to rub off the caked on powder, but I took my time. It was very abrasive stuff. When I had given myself the all clear, I retired again for the night. The morning heralded a remarkable discovery. That German Ajax powder had “Nuked” the fungal bacteria, arrested the “Long March”, and restored peace and unity to the neighborhood. I felt like I’d been rid of a poltergeist. That is one wicked formula, our old Ajax. 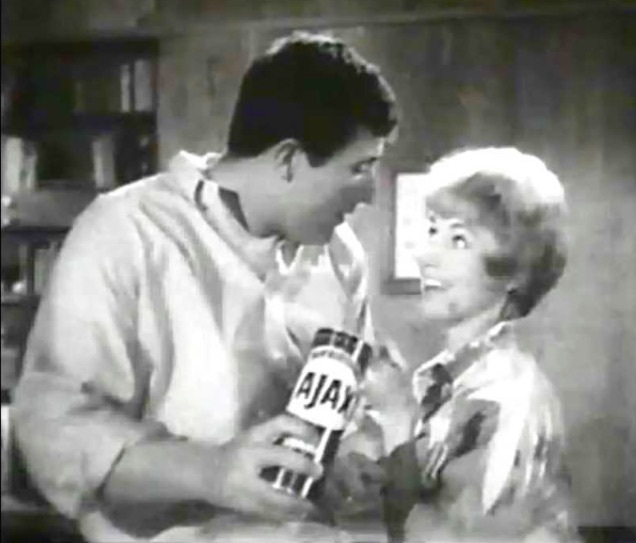 Charlie’s work was done, and I could almost see him grinning and flirting in the bathroom with that charmed 1960’s lady of the household, holding up the Ajax bottle so the camera could get the “money shot”. Naturally I didn’t let on to my hosts about what had transpired. Something again to do with the shame. Of course every little story has a moral, but this one has many. Firstly, be sure to only stay in Hotels that have water! Secondly, always travel with a bicycle lock so you can chain yourself to something large and heavy in the event of a pending eviction. Thirdly, be careful using anything in foreign language bottles, especially in bathrooms where your host has recently sanitized it for your use. If you have foreigners staying at your house, clear away the cleaners and solvents. And of course, lastly … if your overseas guests start itching and walking funny, just leave a bottle of Ajax on the vanity top next to the deodorant. This entry was posted in Humor, Travel and tagged Ajax, Germany, humor, No mess charlie, talcum powder, Travel. Bookmark the permalink. 1 Response to My brush with “No Mess” Charlie.